1. Wash dal and pressure cook it in water for 2 whistles (if not using pressure cooker, cook until it becomes soft). 3. Add onions, slit green chills and fry till translucent. 4. Add ginergarlic paste and fry for 2 more mins. 5. Add turmeric, cooked dal and salt. 6. Let it cook for 2 mins and take it off the stove. 7. Garnish it with coriander and mint leave. 8. It can be served with roti or white rice. 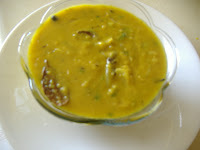 Adding whole spices like cloves, cardomom to dal seems very interesting. I am sure it must have tasted wonderful. Looks yummy.......Spicy with cloves is nice and different delcious taste. Next time I add this spicy in my dal. LOve this Dal also called as dal fry, if I am not mistaken.